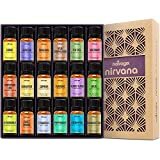 THE RAPEUTIC GRADE ESSENTIAL OIL SET - Natrogix Nirvana is the ultimate essential oils set, holding eighteen (18) painstakingly extracted essential oils. Used alone or combined together in exquisite sensory recipes, these oils breath relaxation, joy and healing into any environment. THE PERFECT COMBINATION & FREE RECIPE E-BOOK - Natrogix Nirvana contains the 18 most popular essential oils on the planet: Eucalyptus, Frankincense, Lavender, Lemongrass, Lemon, Moroccan Rosemary, Sweet Orange, Tea Tree, Peppermint, Turmeric Oil, Tangerine, Ylang Ylang, Basil, Cedarwood, Spearmint, Bergamot, Copaiba Balsam, Cinnamon Leaf. 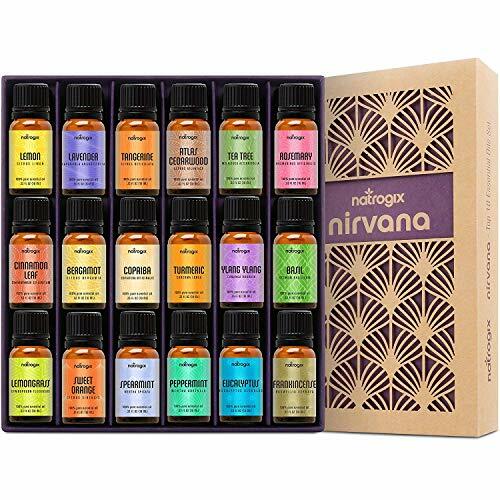 We've created 200 custom recipes for your Natrogix Nirvana set, and you get the book free with today's purchase. DELICATE OILS PROTECTED - Cradled inside each enlightened box of Nirvana are eighteen 10ml bottles with easy-use droppers. The gold amber tint of the strong bottles guard these precious, delicate oils from light and UV degradation. All natrogix oils are bottled in FDA certified facilities in the US. HIGHEST QUALITY GUARANTEED AND - We are truly proud of Natrogix Nirvana. All 18 oils are GC/MS certified, and NO pesticides, herbicides, GMOs or other additives. Please kindly understand smell is NOT everything about essential oils. Their main job is to be absorbed into our system by breathing and through skin absorption, to promote health and wellbeing. Some oils smell "chemical" because of containing 100% natural chemicals form the plant such as alcohols, aldehydes, esters, ketones, etc. LIFETIME 100% MONEY-BACK GUARANTEE - For every Natrogix Nirvana, we offer customers a LIFETIME 100% Money Back Guarantee! We're so confident that you'll love our 100% pure Natrogix Nirvana essential oils that we'll refund every penny if you don't like it! What do you have to lose?